Mathew Barzal scored a natural hat trick in the second period as the New York Islanders blanked the Toronto Maple Leafs 4-0 on Saturday, on a day where John Tavares played his former team for the first time. John Tavares had a front-row seat for Mathew Barzal's first-career hat trick a little over a year ago as his friend, teammate and captain. The shifty centre's second three-goal game in the NHL left Tavares with a decidedly different feeling Saturday. 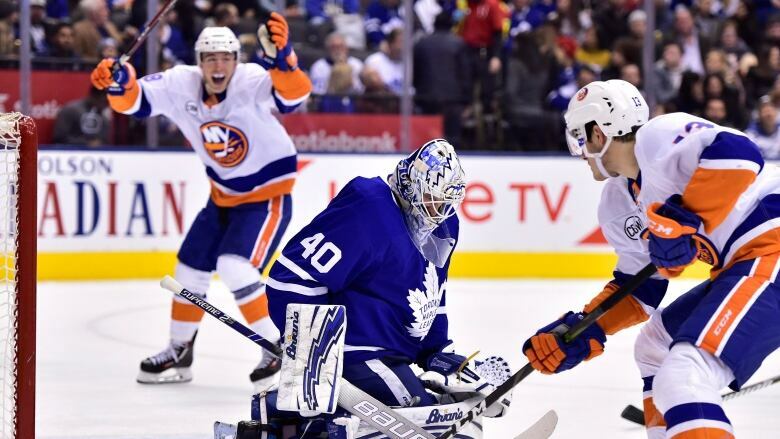 Barzal scored a natural hat trick in less than eight minutes of action in the second period as the New York Islanders downed the Toronto Maple Leafs 4-0. The game marked the first for Tavares against the Islanders since he bolted New York to sign with Toronto in free agency on July 1 — a move to the franchise he cheered for growing up in the city's suburbs that gripped the hockey world. "Anticipation and a lot of unknown," Tavares said of his emotions before puck drop. "Going against a lot of familiar faces ... I just tried to handle it as best I could. "Just wish I could have played better and got a better result." The 28-year-old spent nine seasons in New York, collecting 272 goals and 349 assists for 621 points in 669 games. "To have one like tonight's obviously disappointing," said Tavares, the first pick in the 2009 NHL draft and Islanders captain from September 2013 until he signed with the Leafs. "It's going to leave a sour taste. "Hopefully we can learn from this." Tavares has 26 goals and 18 assists in 39 games with his new team, but saw a six-game point streak come to an end as his old club got a measure of revenge led by Barzal's outburst. "We all love Johnny," said Barzal, the reigning NHL rookie of the year. "He was such a big part of this team. "We wanted to beat him, I'm sure he wanted to beat us." Valtteri Filppula had the other goal for New York (20-13-4), which has won six of its last seven. Robin Lehner made 36 saves for his second shutout of the season, while Ryan Pulock added two assists. Garret Sparks stopped 24 shots in taking the loss as Toronto (26-11-2) saw its five-game winning streak snapped. "We weren't good enough," Leafs head coach Mike Babcock said. "They gave us a lesson." With the Islanders up 1-0 through 20 minutes, Barzal doubled New York's lead at 2:49 of the second with a deft tip. The 21-year-old scored his second of the night 2:07 later on a power play when his one-timer deflected in off Leafs defenceman Nikita Zaitsev. The hat trick came in just 7:44 and marked the first time an Islanders player has scored three times against the Leafs in the same game since Mike Bossy on March 20, 1986. "Guys were ready to go," said Barzal, whose other hat trick came Dec. 23, 2017, against Winnipeg. "We knew what was at stake, we knew it was a big game. "We play like that, this team can be pretty special." Tavares had a diving chance to get his listless team back in it with seven minutes left in the second, but Lehner — who didn't have a lot to do in picking up the 10th shutout of his career until the game was well in hand — was there to make the stop. "They're really dedicated to what they do and the work ethic they bring," Sparks said. "For whatever reason, the puck didn't bounce our way." A significant chunk of the crowd at Scotiabank Arena showered the Leafs with boos at the conclusion of the second period, while an Islanders fan near the tunnel to Toronto's locker-room flashed a homemade sign with the word "Loyalty" clearly directed at Tavares. The Leafs will now try to regroup ahead of Thursday's rare afternoon home game against Minnesota. The Islanders visit Buffalo on Monday. "We turned the puck over, they countered," Babcock said. "We were on the outside, they were on the inside." Sparks, who notched a 4-2 road victory Friday over Columbus in Toronto's first game after the NHL's Christmas break, got his third straight start. Leafs No. 1 goalie Frederik Andersen backed up Sparks the last two games, but didn't dress against New York because of a groin injury that has him listed as day-to-day. Kasimir Kaskisuo was recalled from the AHL Marlies on an emergency basis.